Author/Opus: This is the 61st puzzle from our contributing puzzlemaster John Bulten. Answer String: For each cell in the marked rows/columns, enter the area of the polyomino it belongs to. Enter just the last digit for any two-digit number. Start with the 6th row, followed by a comma, followed by the 3rd column. Note: Follow this link for other classic Fillomino and this link for more variations on Fillomino puzzles. If you are new to this puzzle type, here are our easiest Fillomino puzzles to get started on. More Fillomino puzzles can be found in The Art of Puzzles, in Fill o’ Fillomino and Fill o’ Fillomino 2 by Grant Fikes, and in our beginner-friendly book Logic Puzzles 101. I like how the aha moment isn’t so much a “break in” but a constant presence throughout the solve. Very elegantly designed puzzle. This is an utterly brilliant Fillomino! It’s the first genuinely original idea in vanilla Fillomino that I’ve seen in years, and, to be honest, I didn’t really expect that there were any more genuinely original ideas in vanilla Fillomino to be discovered. An impressive achievement in terms of both aesthetics and technique, and an awesomely entertaining puzzle. Thank you! Ahh, that should’ve been “for a ten-by-ten dice vanilla Fillomino”, sorry. After figuring out the hidden constraint, it feels like I am solving a Nurikabe puzzle. Early days in 2019, but I predict a fave spot by the end of the year ! That one was really great — wow! Thank you all! I suspect that a couple givens can be shaved off this total, but it might not be pretty; those computer-found 17-given sudokus are rather involved, and to be honest I think the same of some consecutive sudokus. At any rate the gauntlet is out. Anyone having difficulty might prefer to start with a search for Checkered Fillomino (or Heavy Dots or Winddraughts), although until you get the feel those might be equally intractable! For easier Fillomino, https://www.gmpuzzles.com/blog/2015/04/fillomino-john-bulten/ explores a much simpler version of this theme. What a phenomenal puzzle. Absolutely wonderful from start to finish. Thank you. Great puzzle John! Thanks for showing us something new! Amazing puzzle, but spotted the special restriction much later than I would have liked, leading to several minutes of a complete standstill! 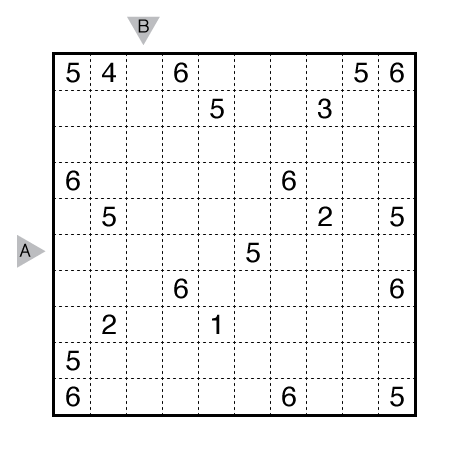 On the topic of 17-clue sudokus, amazingly, one such sudoku on the website https://theconversation.com/good-at-sudoku-heres-some-youll-never-complete-5234 can be solved using only naked and hidden singles.